Goodbye, AIM. ICQ and MSN Messenger were always far more popular in Singapore, but “AOL” was useful for catching up with American friends. AIM tapped into new digital technologies and ignited a cultural shift, but the way in which we communicate with each other has profoundly changed. As a result we’ve made the decision that we will be discontinuing AIM effective December 15, 2017. We are more excited than ever to continue building the next generation of iconic brands and life-changing products for users around the world. That last sentence had more cringe than anything early-teenage Ruben ever posted on AOL Messenger. They even worked in an excited. 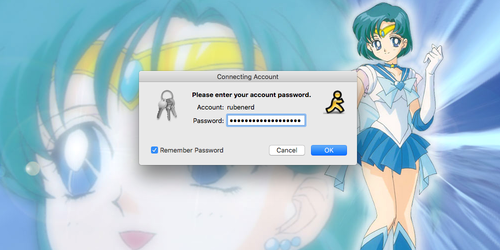 The best I could for a send-off screenshot was to resurrect the background of Sailor Mercury — the gentleman’s choice — that I used for years, and the login prompt given I’ve long since forgotten the password! Or maybe I didn’t forget, and the auth server isn’t responding already.